California Quake Means Big Damage For Napa Valley Wineries : The Two-Way It's still too early to tell just how much the magnitude-6.0 quake will cost the region, but it comes after a drought had already made things difficult for wineries. Winemaker Tom Montgomery stands in wine and reacts to seeing damage following an earthquake at the B.R. Cohn Winery barrel storage facility on Sunday in Napa Valley. Luckily, a historic magnitude-6.0 earthquake in California over the weekend has not resulted in the loss of any human life. The wine country, however, was deeply affected. While it's still too early to tell just how much the quake will cost Napa Valley, what's clear is that some wineries lost some of their most cherished reserves, worth hundreds of thousands of dollars. 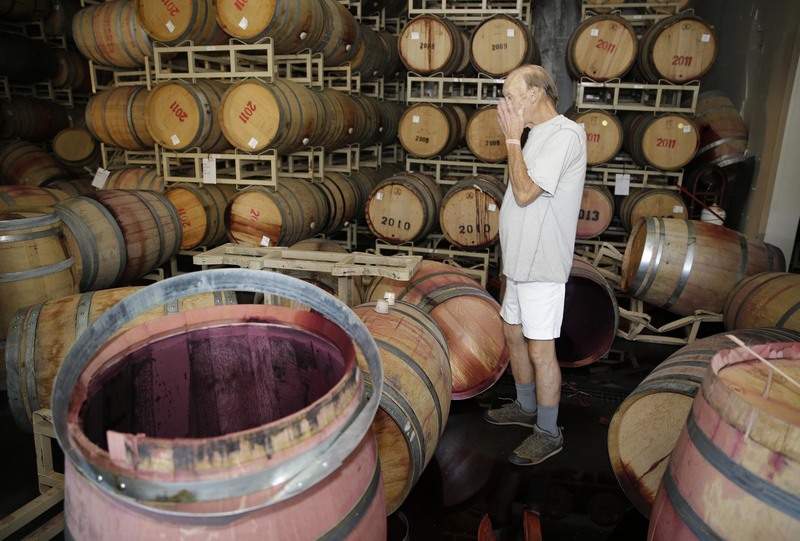 "David Duncan, president of Silver Oak Vineyards, was worried he lost 'every single barrel.' Instead, he seemingly got off easy; he only lost three barrels, but they were a top-quality vintage. "Each barrel holds 25 cases of wine, and each case can cost $1,300. So they lost about $100,000 'just in the three barrels,' Duncan said.
" 'We actually call it the inner sanctum of the winery,' Duncan said. 'It's very special, unique reference wines, and we don't sell them. And so to lose them ... they are gone forever.' "
The Wall Street Journal reports that the earthquake is the strongest to hit the Bay Area since 1989. One seismologist said the damage caused by the quake could exceed $100 million. Napa County, which felt the greatest effect, contributes about $13 billion to California's economy. The AP reports that while Napa produces only 4 percent of California's total wine crop, its wines are the most prestigious. "B.R. Cohn lost 'as much as 50 percent' of its wine, [Tom Montgomery, a winemaker for the company], said. The winery focuses on high-end, single estate wines that retail between $40 and $100 a bottle.
" 'It's not just good wine we lost, it's our best wine,' he said. "Even the wine in barrels that wasn't damaged by the quake may have problems, however, because wines aging in barrels are supposed to be kept as still as possible, Montgomery said." In other related news: The San Jose Mercury News reports that California's earthquake early-warning system, which is still being tested, worked. It gave a UC Berkeley lab 10 seconds of warning. "The successful alert was the biggest test yet in the Bay Area for a type of earthquake early-warning system that's not yet available to the public in the U.S. but already is providing precious seconds of notice before quakes hit in Mexico and Japan. "The ShakeAlert system — a collaboration between Cal, Caltech, the University of Washington and the U.S. Geological Survey — could one day stop elevators, control utilities and alert motorists of an impending natural disaster. But before it is reliable enough to launch throughout the West Coast, the system needs about $80 million in equipment, software and other seismic infrastructure upgrades. "So far, despite Gov. Jerry Brown signing a new state law last fall ordering the creation of an early-warning system, the project has received only about $10 million, mostly from a private foundation, said Thomas Heaton, a geophysics professor at the California Institute of Technology. The USGS's earthquake budget is only a fraction of what it was 30 years ago, he said."